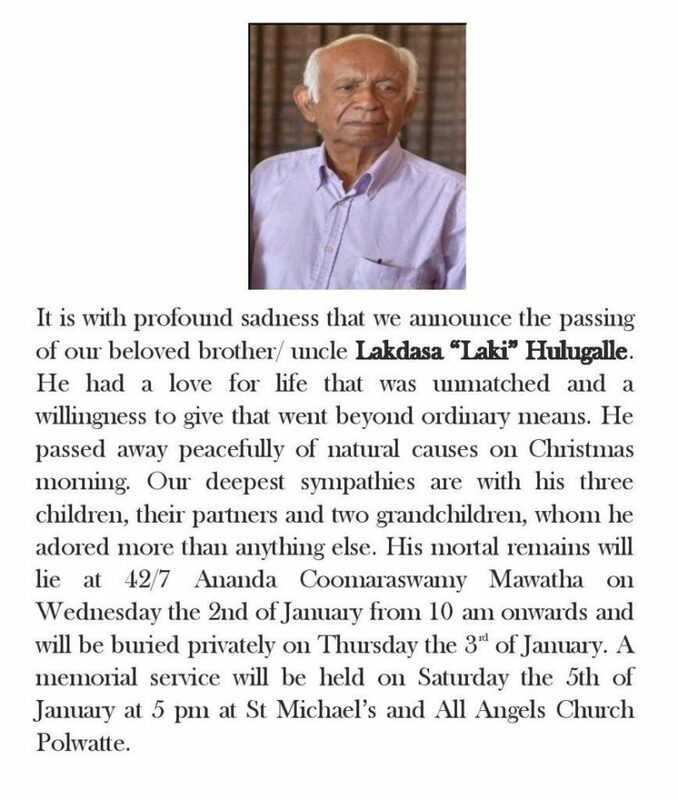 January 2, 2018 (LBO) – Christmas Day 2018 saw the passing of Lakdasa Hulugalle at the age of 86. Hulugalle served as a Senior Economist at United Nations agency UNCTAD, and was my father’s elder brother. We spent a fair amount of time together and had many a discussion on our shared interests of politics, investing, and Sri Lanka. Lakdasa Hulugalle was the son of Journalist and later diplomat H.A.J. Hulugalle and Lillian De Soysa. He schooled at St. Thomas’ College and also St. Thomas’ Prep. When I recently met the headmaster of Prep School he had said that Lakdasa had recently participated in the annual Prep walk. He later studied at Peradeniya and went on to read economics at St. Catherine’s College, Oxford University. He spent close to 3 decades at the United Nations working as an economist at UNCTAD. He was coached into landing a position at the U.N. by his close friend Lal Jayawardene, son of Central Bank Governor N.U. Jayawardene. Lal Jayawardene ended up helping Lakdasa land a job which was at a higher grade than he had secured for himself! Hulugalle had developed many close relationships over the span of his career in the UK and Switzerland. Among his circle of friends in Switzerland were Gamini Corea, Lal Jayawardene, and Liaquat Ali. He once drove me around Switzerland in an old Volvo, a car who’s claim to fame was that it was purchased from the man who would become the Prime Minister of the world’s largest democracy. Manmohan Singh was also in the group of friends with whom Hulugalle spent much time with before the sikh’s meteoric ascendance to India’s Finance Minister and later PM. Among the people he moved around with in Sri Lanka during his later years were Sena Wijewardene, Nihal Jayawickrama, and of course his siblings and other relatives. With his brothers he was involved in the founding of Multipacks, at one time one of Sri Lanka’s largest publishing companies. I first became familiar with my Uncle Laki as a child. Born in America, one of my first vivid travel experiences was when I visited North End House in the village of Mottisfont. Mottisfont is situated about a 2 hour drive from London. My parents had left my two brothers and I in the care of his British wife, Aunty Moira, for at least a week while they traveled alone around Europe. North End House was a residence worth its stately name. It had acres of beautifully landscaped gardens and even a secret room behind a bookcase. Many who read this article may be familiar with this residence as he had hosted many visitors over the years. Over the next few decades I met my Uncle from time to time all over the world. We have crossed paths in England, Switzerland, Italy and Sri Lanka. He was the first person to walk me around Rome, the great city where his father once served as Sri Lanka’s Ambassador. During these meetings we discussed many things, and I learned a great deal about Sri Lanka, a country that at the time I knew little about. One of the things I remember vividly about him was his ability to walk. His daughter once told me that he moves like a mountain goat. She was not kidding as he walked up steep hills in Switzerland with speed and ease. I once went on a walk with him to the neighbouring town from his residence in Mottisfont. I would have been in my twenties and he possibly around seventy. The walk was 10 kilometres after which we stopped for a meal at the pub. Then it was time to walk back the 10km to his residence. My legs were aching as we moved close to 1km away from home. Then this 70 year old man said to me: “why don’t we jog the last bit home?” I bit my tongue and jogged the last part. The next day I was so sore that I was unable to get out of bed. Uncle Laki was of course fresh as a daisy ready to go for another walk the next day. I took a pass on that one. My Uncle Laki would walk for miles upon miles and engage in conversation on all kinds of topics. He was an intellectual and well read. He deeply valued education, sending his children to English public schools like Winchester and Cheltenham Ladies. On politics he seemed to lean left, which was odd for someone like me who grew up in the American system. I heard many stories about his generosity towards my father (his younger sibling) as well as to other family and friends. At around age 60 he retired from the United Nations. He spent much of his 25 year retirement with friends and family shuttling between England, Switzerland and Sri Lanka. My conversations with Lakdasa Hulugalle are probably one of the reasons why I ended up in Sri Lanka. He fuelled my fascination of the island, and educated me on its history and people. Despite spending most of his adult life overseas, his mind was always on Sri Lanka. He was always full of ideas that could help the nation’s economy and uplift the lives of her people. He had much empathy for the poor and downtrodden. Sri Lanka’s leaders have a lot to learn from people like my Uncle Laki. Persons of his experience and caliber remain an untapped resource that Sri Lanka’s leaders have continuously failed to harness for the benefit of the country. Lakdasa Hulugalle’s love of his country was evident in every meeting I had with the man.